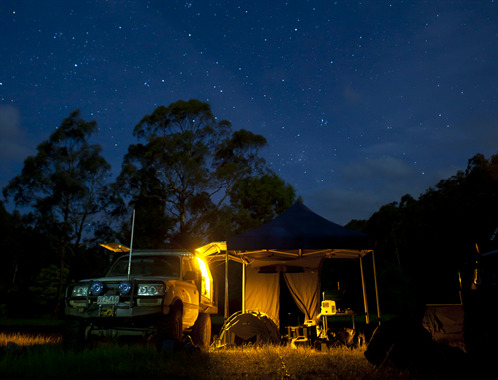 If on a camping trip you want to be able to charge your camera battery, keep your drinks cold and have some lighting while you cook your camp meals and still be able to start your vehicle the next morning this guide to auxiliary battery systems is for you. Interested in alternative power options? Check out our guide to solar power for camping. An isolator is used to connect the two batteries together so the second battery can be charged using the vehicle's charging system. The second battery can also be situated in the camper that's being charged via an Anderson plug. The isolator also disconnects the two batteries when the vehicle is switched off and not running so the main battery is not drained and the vehicle can still be started even though the second battery may be running low. There are two main types of isolating system being used; the first is a solenoid type isolator, which has been around for a long time and is mainly seen in older vehicles and is controlled via the vehicle's ignition switch. A variation on the solenoid isolator is the smart solenoid system. They are basically the same but the smart solenoid has circuitry that includes spike protection and voltage sensing so the solenoid is switched on and off automatically. These are a great cheap system and can be used in nearly all 4WDs. A relatively new system that has been around for about five years now, is the DCDC charger. A DCDC charger is essentially a battery charger just like the one that you use at home, but it uses power from your main battery to charge the second. The great thing about these is they use a three-step charge program to keep the battery in top condition. These systems also come in handy if your vehicle produces a low output voltage because of a variable alternator found in late-model Toyotas and the current-model Ford Ranger. The DCDC charger will actually boost the voltage up to 14.4v to give your battery the best and fastest charge possible. There are a few different types of batteries that can be used in an auxiliary battery system, all with some pros and cons. First there is the starting type battery. These have lots of cold cranking amps (CCA) to be able the start an engine and at the same time can be used to power basically anything 12 volt. The down side to using a straight starter battery is they don’t like to be drained a lot and the life of the battery will be reduced. A deep cycle battery is design to deliver power to 12 volt accessories so it is likely to be the most commonly used battery. They don’t mind being constantly discharged, but they also take longer to charge because of their larger plates inside the battery. A deep cycle can start a vehicle but is available in a lot of different sizes. There is also a combination starter / deep cycle battery that gives you the best of both worlds. If needed, you can use it to jump start your vehicle and from there charge a little faster than a deep cycle while being designed to be discharged without harming the battery. The other thing to think about with batteries is whether to go with a standard Lead Acid or to go with an Absorbed Glass Mat (AGM) battery. The main difference is the way that each is made. The AGM is what is called a ‘Dry Cell’ battery and a Lead Acid is a ‘Wet Cell’ Battery, with dry cell having a longer lifespan (it may also be a little lighter). The other difference is the price, as an AGM battery sometimes costs double what you would pay for a Lead Acid Battery. There would not be too many camper trailers out there that didn’t have some sort of battery system on board. Whether it's a very simple single battery set-up or an elaborate system with all the trimmings, having a battery system in your trailer is a must-have. It means you can still have the fridge and lights running without being connected to your vehicle. The system in the camper is basically the same as in the vehicle and it also gets its charge from the vehicle via an Anderson plug which is designed to carry high current. DC to DC chargers are being used more and more in campers because they are able to boost the voltage, meaning there is no voltage loss. Voltage loss can be a problem because of the length of cable between the vehicle and the trailer. Another common installation is a 240v charger, which can be hardwired and mounted on the rig. Indeed, it is handy to keep the batteries topped up at a caravan park or when the camper is sitting idle in the backyard. The amount of batteries can vary depending on how much room is available, but most of the time there will be enough room for at least two, which can give you up to 200 Amp Hours of power. This would be enough to get you through a long weekend without the need to re-charge. If there isn't any room under the bonnet, a battery box can be another alternative (see left). If you do need to charge the batteries but don’t want to run the 4wd, then this is where a solar panel comes in. Solar panels run through a regulator and will help maintain charge in the batteries while the sun is out. This will most likely get you through to the next morning. Solar panels come in different sizes, both physically and in terms of wattage, so which one you get will depend on where you’ve got to store it. If you are looking to install a battery system, knowing what your power requirements are will help decide what type of system and how many batteries you will need. A battery system is not the hardest DIY project, but make sure you use the correct rated cable and always use fuses. If you’re not much of a DIYer, then any reputable 4WD store will be able to help, but remember to ask as many questions as possible so you know exactly what you’re getting. Return to: Power options for camping guide.